...Built up 416 x 311 5 rooms, 4 bathrooms 1 living hall, 1 family hall 1 indoor garden, 2 balcony Acquired CCC RM 768,000 Now Rebate RM 30,000! New Two and a half storey Semi-D@Kuantan Garden Residence Kubang Buaya Kuantan High-End Presti. ...& Dry Kitchen. 4 Bedroom 4 Bathroom First Floor All Bedrooms attached with individual Bathroom. Nice full tile balcony. Well maintained Garden. 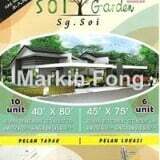 Near to Teluk Chempedak Suitable for own stay with big garden area. Also suitable for homestay.